I love pesto so much that I keep looking for more ways to eat it, and pizza is the perfect compliment. I find that the olive oil in the pesto melts into the crust and makes it taste just like breadsticks. One caution: when you make this pesto, go easy on the olive oil so the pizza doesn’t get greasy. Grill, let the meat rest for 10 minutes, and cut in bite sized pieces. 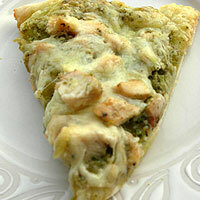 Top with Pesto, chicken, and cheeses. Read our pizza directions and bake accordingly.